Dexter has a lion as big as he is that he carry's around by the neck.. Reminds me of the movie UP! Squirrel! What is always so cool and cute about her is the fierce look in her eyes!! haha, my dogs have the same exact squirrel set.. the one that has three squirrels that fit into a tree stump, right? we also have the birdhouse with little birds and a bumblebee hives with little bumblebees. they find them to be delightful. 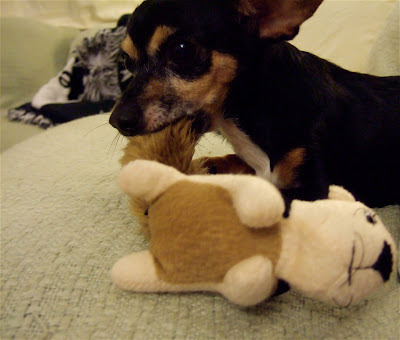 :) my mini-pinscher/pug mix loves squeaking them like crazy.. it must be a small dog thing, haha. You have the cutest puppy in the world!! Why she didn't hunted the rats? my chihuahua (Bear) has his own heating pad after fighting my mom for hers! Hide-a-Squirrel!! Does she also chew the stump? My dog also loves these and also chewed on the house they came in. Hide-a-Squirrel! !